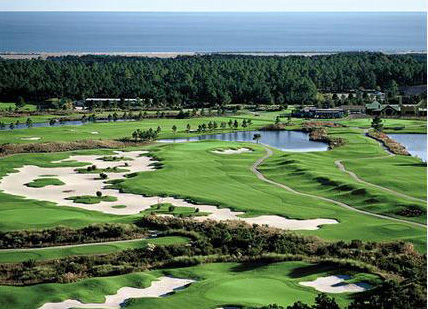 Using more than 10,000 user-submitted reviews, Golf Advisor compiled its list of the Top 50 Courses in the United States in 2016, and Thistle Golf Club, one of the Myrtle Beach area’s best layouts, was ranked 14th. Golf Advisor is the travel portal for Golf Channel, the game’s leading media outlet. A 27-hole facility, Thistle is a 4.5-star layout, according to Golf Digest’s Best Places to Play guide. The Tim Cate design is home to three distinct nines – the Cameron, MacKay and Stewart – and greens that are among the smoothest and fastest in the region. The 15,600-square-foot clubhouse is home to memorabilia from the original Thistle, a nod to the facility’s heritage, that is on display in the clubhouse and it sets the tone for a day that features the best of the game’s past and present. On spring weekends, Thistle even brings in a bagpiper to fill the air with the instrument’s melodic sounds as golfers prepare to play. The three nines at Thistle each offer a different, yet equally rewarding experience. The Cameron is the most open of the three nines, encouraging players to swing away with the driver but with just enough water to keep them from getting to comfortable. The MacKay nine is a more traditional, Carolina pine tree-lined layout, highlighted by the 526-yard (from the white tees) seventh hole. The Stewart has a true, links feel with rolling fairways framed by mounding and stacked sod bunkers surrounding the greens. Located just across state line in Sunset Beach, N.C., Thistle is just minutes from downtown Myrtle Beach.